Arizona Educators United leaders announced Monday that the state’s teacher walkout will proceed into Wednesday. The decision was declared in the statement that was made on a closed group on Facebook, by Dylan Wegela, the administrator of the group, on behalf of the AEU’s leadership. The decision to expand the walkout came when many Arizona teachers gathered for the 3rd day at the Capitol on Monday to protest low-pay and school funding. Also, many schools around the state remained closed, while the Legislature prepared to introduce a budget package that gives them raises but falls short of other demands. The budget package consulted between Republicans who control the Legislature and GOP Gov. Doug Ducey gives the initial 10% of what will be a 20% increase by 2020. The governor is counting a 1%raise awarded to teachers this year as part of that raise, meaning it will be 19% by 2020. It also restores $100 million out of the nearly $400 million in recession-era cuts to a fund that helps schools pay for books, school buses, and other capital expenses. But several teachers interviewed Monday said that doesn’t go far enough after years of low funding that not only left them among the lowest paid in the nation but also has many schools operating with broken equipment and outdated books. Jessica Hauer, a former classroom teacher at a Phoenix-area school district now working in administration, said her district’s schools have worn out central air conditioning, fire alarm and security systems that will cost millions to replace. “The fire alarm system now at (one) school goes off so often the students are starting to ignore it,” Hauer said. Some educators are concerned that the governor’s pay raise only go to teachers with set classes and not help other staff, who teaches at the Apache Junction Unified School District. The question for Ducey and Republican lawmakers who control the Legislature is how long will teachers remain off the job after walking out Thursday. Organizers have said they are making those decisions day by day and plan to continue to keep the heat on the Legislature. Arizona Education Association president Joe Thomas said he believes teachers will be rallying at the Capitol on Tuesday. 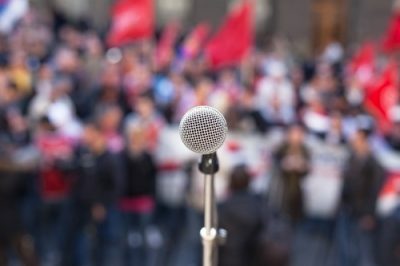 Monday’s rally drew as many as 10,000 teachers, according to estimates from the Department of Public Safety, and the leader of the national teacher’s union, the American Federation of Teachers. Despite the presence of the state and national unions, the Arizona walkout is mainly led by a grassroots group of teachers that mobilized after a strike in West Virginia in a movement that’s spread to several other states. Demonstrators, now in their third day at the statehouse grounds, came prepared with tents, chairs and plenty of water. Several teachers said they’re ready to show up Tuesday and beyond, including Margaret Cordova, a teacher at Sonoran Sky Elementary School.